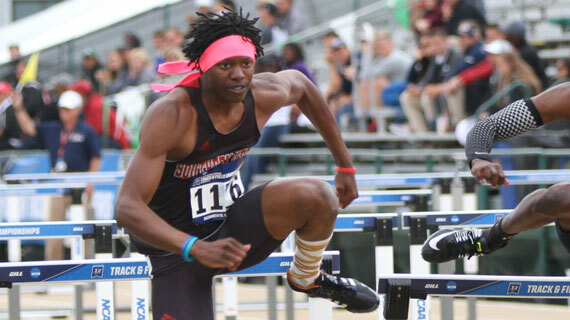 Thunderbird sprinters were in action on the second day of NCAA Preliminary competition at Hornet Stadium on Friday, with two T-Birds qualifying for quarterfinal action on Saturday. Tre James competed in a pair of events for the T-Birds, running in both the 100-meter and 200-meter. James ran in the quarterfinals of the 100, where he finished with the 12th fastest time in the field at 10.39. Despite that placement, James was unable to qualify for NCAA Nationals due to other automatic qualifiers. The sophomore also competed in the first round of the 200-meter, where he qualified for quarterfinal action with a time of 20.97. James will continue competition in the event on Saturday. Making his third-straight trip to NCAA Regionals, Devon Montgomery made it into quarterfinals with a time of 14.07. Not only did that time advance him further in the competition, but it also set a new Southern Utah school record. Montgomery will continue competition on Saturday as well. The meet will conclude on Saturday evening, but not before seven Thunderbirds have an opportunity to advance into the NCAA National Championship in their event. The meet can be viewed on FloTrack for a fee. Live stats for the meet can be found here. Stay current on the Thunderbird track and field programs by following @SUUTFXC on Twitter and Instagram and like the Southern Utah Track and XC page on Facebook. Head to suutbirds.com for all Thunderbird athletics news.